Though, fire safety systems & equipment is a mature market; however, is posting significant growth on the back of increasing safety concerns, fire incidences, and infrastructure development in the country. During 2010-14, around 121,230 fire incidences were recorded in India, resulting into more than 13,720 causalities. With increase in the number of fire incidences in the country, the government is taking strict measures to counter such incidences; especially regulations pertaining to residential and commercial buildings (for multistoried or high rise buildings) and these factors would drive the India fire safety systems and equipment market forecast revenues over the coming years. According to 6Wresearch, India fire safety systems and equipment market size is projected to grow at a CAGR of 9% during 2017-23. Over the last few years, demand for fire safety systems and equipment market has surged due to growing consumer awareness, which is likely to continue during the forecast period. In the overall fire safety systems and equipment market, fire fighting segment generated highest revenue share, followed by fire detection, and emergency & exit lighting segments. In 2016, the western region accounted for largest India fire safety systems and equipment market share in the country followed by southern region. Major development in commercial and residential verticals have been witnessed across the western region. Some of the key players in India fire safety systems and equipment market include- Honeywell, Tyco. Nitin Fire Protection, Siemens, HD Fire, UTC, etc. The India Fire safety systems and equipment market report thoroughly covers the India fire safety systems and equipment market by types, verticals and regions. 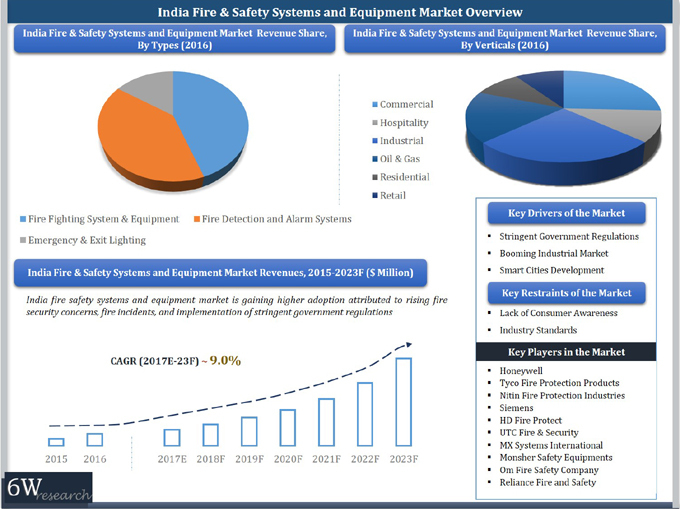 The India fire safety systems and equipment market outlook report provides an unbiased and detailed analysis of the on-going India fire safety systems and equipment market trends, opportunities high growth areas, market drivers which would help the stakeholders to device and align their market strategies according to the current and future market dynamics. 14.2	Tyco Fire & Security India Pvt. Ltd.
14.3	UTC Fire & Security India Ltd.
14.5	Nitin Fire Protection Industries Ltd.
14.6	HD Fire Protect Pvt. Ltd.
14.7	MX Systems International Pvt. Ltd.
14.8	Monsher Safety Equipments Pvt. Ltd.
14.9	Om Fire Safety Company Pvt. Ltd.
14.10	Reliance Fire And Safety Ltd.